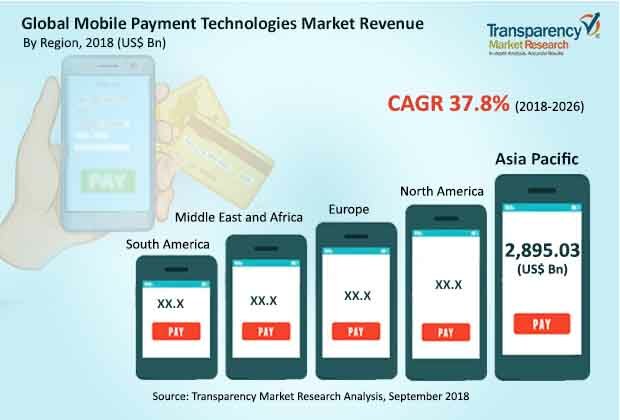 The global mobile payment technologies market was valued at US$ 2,943.58 Bn in 2017 and is expected to expand at a CAGR of 37.8% from 2018 to 2026, according to a new report published by Transparency Market Research (TMR) titled “Mobile Payment Technologies Market – Global Industry Analysis, Size, Share, Growth, Trends, and Forecast, 2018–2026”. Asia Pacific region is expected to hold the dominant revenue share, with the market in the region expanding at a CAGR of above 30%. The global mobile payment technologies market is mainly driven by growing adoption of smart appliances and increasing mobile data usage across the world. Mobile payment systems enable consumers to make immediate payment by using a smartphone. The growing number of mobile users and the increasing adoption of smart devices such as smartphones & tablets are expected to fuel the growth of this market. Mobile payment solutions are increasingly adopted by emerging economies, and growing adoption of smart appliances and rise in mobile data usage are anticipated to fuel the growth of the mobile payment technologies market during the forecast period. This is primarily due to the ease of communication and growing demand for convenient transactions by consumers around the world. Smart appliances such as smartphones and tablets, with their associated applications, are the primary requirement for mobile payment technology, which allows payment without using traditional financial transaction channels. Also, demand for digital payment solutions is increasing around the globe. Digital payment systems allow consumers to make immediate payment by using a smartphone. The adoption of immediate payment technologies is unceasingly increasing in developing regions such as Asia Pacific and MEA. This is also a major factor that is expected to boost the mobile payment technologies market in the coming years.The growing adoption of mobile payment technology, including the usage of different applications and mobile wallets has led to the entry of cashless technology corporations into the payment landscape. These factors are also driving the mobile payment technology market. The mobile payment technologies market can be segmented based on type, purchase type, end use, and region. The type segment is further classified into proximity payment type and remote payment. The remote payment type is significantly popular among users. Within the purchase type segment, money transfers & payments tends to hold the largest market share in terms of revenue. Several end-use industry verticals, especially the retail sector are looking for mobile payment technologies to ease payment transactions. Also, it expected to grow at a higher CAGR during the forecast period. This is primarily driven by major factors such as urbanization, income growth, favorable government regulations and policies, and changes in tastes & preferences of consumers across the world. The retail industry is also expected to see an exponential growth in the coming years. In terms of geography, the mobile payment technologies market is segmented into five regions namely, North America, South America, Middle East & Africa, Asia Pacific, and Europe. Among these, Asia Pacific is expected to hold a major share of above 50% of the market, in terms of revenue, by 2026. The growing adoption of smart appliances such as mobile phones, smartphones, and tablets is a major driving factor for the strong growth of the mobile payment technologies market in Asia Pacific. Also, government led initiatives in China and India to promote digitization is further helping in the growth of the market. Major players operating in the global mobile payment technologies market include MasterCard International Inc., Visa, Inc., American Express, Co., Boku, Inc., Fortumo, PayPal, Inc., Bharti Airtel Ltd., Vodafone Ltd., AT & T, Inc., Google, Inc., Apple, Inc., Microsoft Corporation, Ant Financial Services Group, and Tencent. These players are focusing on acquisitions and new strategic collaborations in order to increase their market share in the global mobile payment technologies market.